I know that a lot of the readers of this blog are newly diagnosed families looking for hope. I know this because I spent several months trolling the web doing the same thing. I didn't find much. Hope, I mean. I found a lot of information, much of it painfully clinical. None of it mentioned the way I felt as I was browsing. And all of it was definitive and horrifying: Deaf. Blind. No cure. Few others. It was not what I needed to read. I've written this before, but from the moment I first learned about Usher syndrome, I knew my daughter Bella had it. It answered all the questions about her. The deafness we knew, but why did she have such a hard time learning to walk? Why was she so clumsy? Why did she have difficulty seeing the stars or finding my face when I kissed her goodnight? Usher filled in all the blanks. So I didn't need the confirmation of a blood test. I went straight to depression. I proceeded to spend the next three months laying on the floor. Literally. Well, not the entire three months. I managed to go to work and play with my kids. I even managed to smile. But I lived a double life. During the day, when the kids were awake and the world could see me, I acted normally. 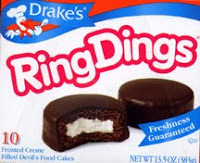 In the evening when they went to bed, I went to the cupboard, grabbed a bag of Cheetos and a box of Ring Dings, shut off the living room lights, lay down on the floor, and gorged myself with misery and snacky cakes. I put on twenty pounds and with each lick of my sticky fingers I felt worse about myself and my situation. But I slowly figured out that all the predictions about Usher syndrome were wrong in one way. Everything I read said the future would be miserable, but I wasn't finding that to be the case. When I would wake up in the morning and brush aside the plastic wrappers, I found my daughter acted exactly the same way she had the night before. She saw the same things, played the same games, laughed the same way. Her eyes might have been deteriorating, but it was certainly imperceptible to me. So I gained a little confidence. I convinced myself that I could take a breath, just one more breath, and that when I finished exhaling, Bella would still be able to see. Then I tried ten breaths. Still the same. An evening. A day. A weekend. I could go to work all day and return to find her virtually unchanged. I had been told that her future would be terrible but that was the future and it wasn't terrible at all. In fact, it was basically the same. Before I knew it, I was off the floor, able to go a breath, an hour, a day without fear of the future. We're now three years in to this diagnosis and the future looks less and less like it was supposed to be. I still don't like to travel without my kids. A week away still makes me nervous. I know it's unwarranted, but part of me will remain on the floor covered in orange Cheeto dust until we find a cure. But I can function now. So here's five more reasons why you, too, can feel confident in getting up off the floor. You Are Not Alone. Not only are you not alone, but you are part of a community, an Usher syndrome community. Sure, it's not large, but I have met literally hundreds of people in the last three years with Usher syndrome. Many of them have become my closest friends because we share something others don't understand. I have also found that the professionals working in this field, the real experts on Usher syndrome, are wonderful people. I don't know if we are just lucky in that way or if the circumstances of Usher promote it, but it is true. Perhaps it is because it is such an intimate community where word spreads fast or because, quite frankly, no one gets in to Usher research for the glory or the money. Whatever the reason, I feel blessed to be part of this group. Now if you are new to Usher syndrome, you probably do feel quite alone. The quickest way to rectify that is to join the Usher Syndrome Coalition Family Network. You'll meet lots of families quickly. There are also a couple of Facebook sites you can friend. Here is one for teenagers. Finally, once a year we have an Usher syndrome family conference. This year it will be held in Seattle on July 9th and 10th. It's a great place to meet other families and some of the best Usher researchers. Usher syndrome is still rare. I used to be fond of saying that there is probably not another person in your town with Usher syndrome. I live in a town of about 5,000 people outside of Boston. My wife was in the local paper for her stint on Who Wants to Be a Millionaire. Shortly after publication I got an e-mail from a man with Usher syndrome. Not only did he live in the same town, but he lived about a mile from my house! So you are most decidedly NOT alone. You just need to learn how to find the others. It ain't over till it's over. (Boy, Yogi Berra quotes all over the place in this one.) Life isn't over just because you have Usher syndrome. My daughter loves to ride horses. My first thought when she was diagnosed was 'How am I going to tell her she can't ride anymore?' The solution? I'm not. She still rides. She learned to ice skate this year, too, and she did so in the evenings on a poorly lit home rink. In short, little has changed. She might hit limitations at some point but who knows when that will be? A million things could happen between now and then. At the moment she has a better chance of giving up horseback riding because she took up chasing boys (talk about making me depressed). Bella is not unique, either. I know other kids with Usher that play soccer, baseball, sing in chorus, and do ballet. I know adults with Usher that are photographers and architects, Olympic level athletes and mountain climbers. And I know a 60 something year old that still drives her car because she retains a lot of usable vision and can still pass the drivers license peripheral vision exam. In other words, don't believe the misery diagnosis. It's wrong. The future ain't what it used to be, Part I: Differing outcomes. So how is it that a 60 something year old has enough vision to still drive when all the literature says someone with Usher will be blind at a much younger age? Well, we're finding out that the more we learn about Usher syndrome, the less we know. The truth is that there is no set outcome for people with Usher syndrome. Even those with the same type of Usher may see very different outcomes. That's because there are a number of different mutations that can cause Usher syndrome and those mutations have different modifiers. As a result, not all Type 1s, for example, act like Type 1s. In fact, we don't really know how they will act. Even siblings that have the exact same mutation might have different results either as a result of other genetic differences or due to environmental factors such as diet and exposure to light. Better still, we're finding more and more people out there who have gone undiagnosed simply because they didn't look like normal Usher people. Their vision or their hearing or their vestibular function was better than the traditional diagnosis would expect. There are those that are worse, as well, so don't read from this that there is no danger. It's still there and it's still very real. However, if someone tells you they know definitively what the future holds for you or your family member, they are wrong. That's why talking to the best physicians and researchers can be maddening for a parent or a person with Usher. We want predictions on the future. They give percentages. In fact, the real experts on Usher syndrome often won't even give you that much information. They don't want to give you false information so they'll only tell you what we know to be fact. Like I said, we're finding that is not much. The future ain't what it used to be, Part II: Treatments. There are treatments available today for Usher syndrome. Many doctors prescribe vitamin A in combination with DHA to slow the vision loss, for example. Sunglasses might help as well. More importantly there are a number of treatments nearing clinical trial that hold promise. I tell parents of newly diagnosed young children that I believe their children will not lose their vision. I tell them that because of the number of treatments that will become available over the next decade, long before a young child experiences serious vision problems. I also tell them that because I'm not a doctor or a researcher. I deal in emotions, not fact, so, as I seem to write in every post, I am not to be trusted. Here's the best reason for you to get off the floor: You CAN help yourself or your child. Remember how I said that we are realizing we know less than we thought about Usher syndrome? Well, you can change that. Get genetically tested. Visit your ophthalmologist regularly so we learn your natural history. Help us learn how Usher syndrome really works so we can develop treatments more quickly. And join the Usher Syndrome Family Network so you can help other families. When people make a connection, they stay engaged and when they stay engaged, we learn more about how Usher syndrome works. You are the key to changing your future. So put down the Suzy-Qs and get up off the floor. Remember, the future ain't what it used to be.